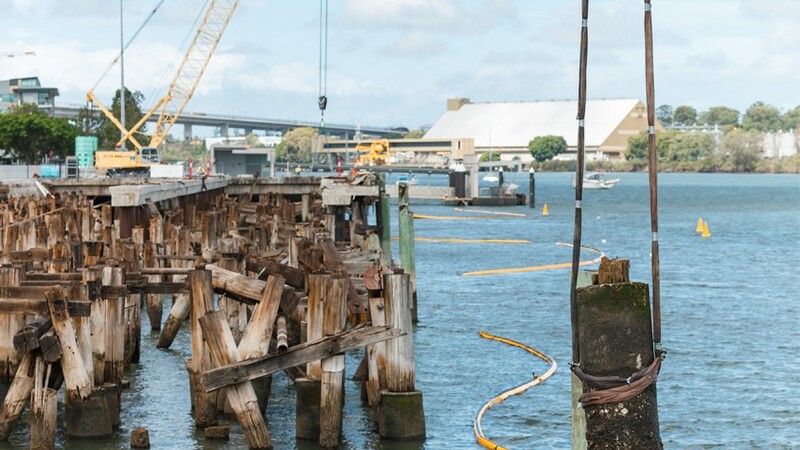 The project involved the removal of wharf structures including the removal of 18,000m2 of concrete deck and substructure including timber bearers, joist and concrete head stocks, edge beams and the removal of over 1,900 piles. Liberty Industrial was awarded both Stages 1 and 2 of the project, delivering both stages concurrently to satisfy the client’s tight scheduling requirements. The project presented a number of challenges that required innovative thinking to solve. At the time of tender, there was a general consensus that the wharf could support excavator loads to enable the efficient removal of the substructure timbers. The client requested that Liberty Industrial undertake a more detailed structural assessment to confirm this understanding was correct. This assessment uncovered the wharf to be in a state of disrepair such that the largest excavator able to work form the deck was only eight tonne. This required a complete rethink of the method while meeting the client’s key requirement to reach project completion within the same time frame. We developed a method utilising large crawler cranes that could reach to the full length of the wharf while sitting behind the revetment wall and on the land side. Detailed lift studies were undertaken so that concrete panels and header beams could be cut and lifted in large sections to reduce preparation and rigging times. Chemset bolts were set into the slabs to enable lifting and lifts in excess of 30 tonnes were achieved. Complex rigging of the substructure timber was also undertaken so that large sections of the structure could be removed in single lifts. Given that some sections of the wharf were derelict there was a serious risk of wharf collapse as the works progressed. 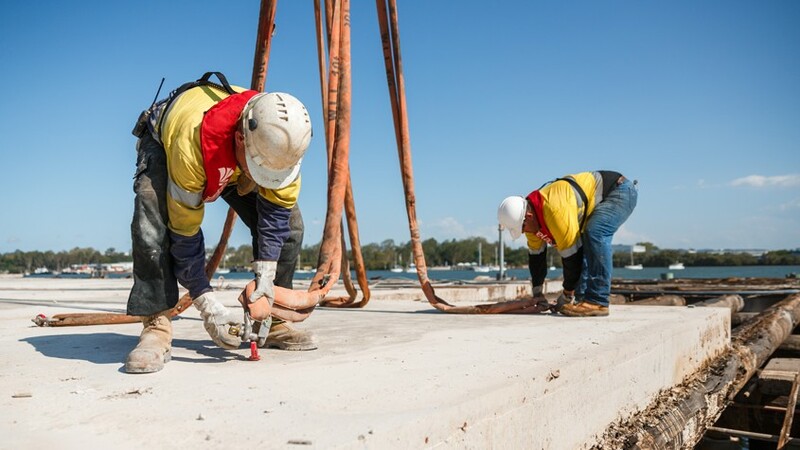 This required the slab cutting to be completed in a methodical and staged manner so the entire wharf stability would be maintained throughout the works. 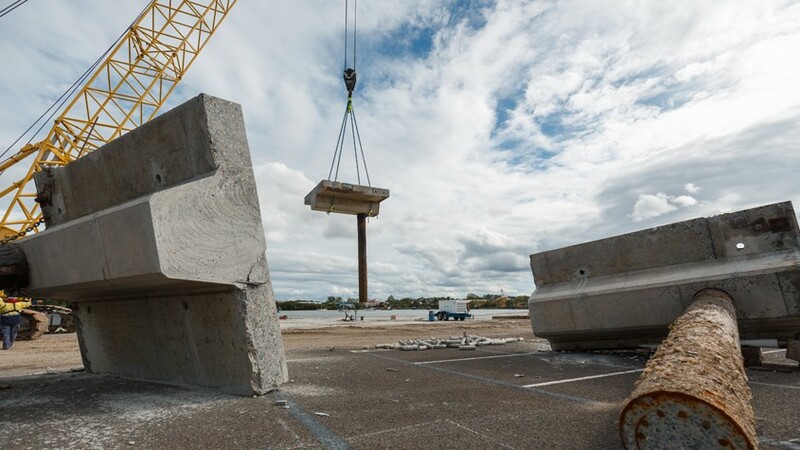 A detailed cut plan and strategy was developed with some sections of wharf substructure being presecured to the underside of the slabs to prevent them from collapsing into the water during lifts. This was a critical aspect of the project due to the number of commercial and recreational boat movements nearby the site. The piles varied from timber with concrete sleeves to hollow and concrete filled steel piles some of which exceed a metre in diameter. The 1,900 piles had to be cut a metre below the existing seabed depth rather than completely removed to ensure the ongoing stability of the existing seawall and river bed. Three full time dive crews dedicated to specific techniques were deployed to implement a range of innovative underwater cutting techniques. Tools and techniques included underwater dredging to expose the piles a metre below the seabed, specialist Riggers to safely sling the concrete protective sleeves which existed on the majority of the piles, underwater hydraulic chain saw to cut the 1,900 timber piles and underwater diamond wire cutting equipment to cut steel and concrete piles. The original methodology allowed for the piles to be removed via barge mounted crane with vibrating head attachment. The Brisbane River on which the works took place has strong tidal flows and is also subject to very significant flooding. In this section of the river commercial ships including large cruise liners frequently pass and turn adjacent to the area. Shipping access was a key consideration and given that approximately 1,900 piles were being removed from a fairly steep bank, geotechnical stability was also a factor. The client undertook a geotechnical assessment and decided that removal of the piles would cause unnecessary risk to the stability of the river so an alternative method needed to be developed. It was decided that all piles needed to be cut 1m below the existing river bed to retain ongoing bank stability and allow for future shipping navigation close to the area. Again the client required that the original program completion date be maintained. Liberty Industrial commenced discussion with a specialised dive contractor to undertake these works. 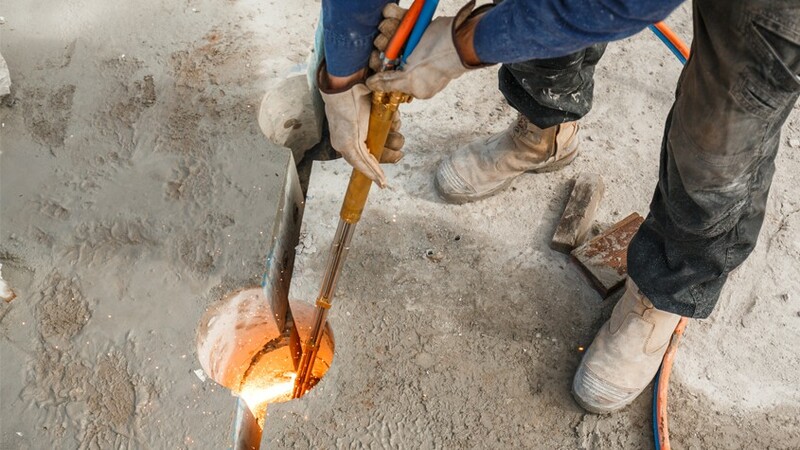 Approximately 150 of the 1,900 piles were steel cased piles filled with reinforced concrete. The cutting of these piles, approximately eight metres below the water, was a critical consideration to ensure works could be completed on time. In consultation with the dive subcontractor we sourced a specialised underwater, hydraulically driven wire saw. These works needed to progress ahead of the slab deck and superstructure removal due to safety considerations and therefore approximately 30 diamond wire cables were acquired. This enabled the dive crew to move ahead of the works and leave the cables in-situ around the piles on the river bed (still joined to the superstructure). After the superstructure was removed the cables could be recovered and the process repeated. Due to the tight program requirements, we mobilised three separate dive crews so works could progress efficiently. During site works, we discovered two 1,100mm diameter steel piles previously not identified at tender stage. The underwater diamond wire saw only had a throat opening of 900mm so a new method of removal needed to be developed. These piles were removed in two sections also due to their weight and the fact they were located on the outer edge of the wharf structure. The outer steel casing was originally cut with underwater torches to expose the reinforced concrete. The concrete was then hammered back (underwater) and the reinforcement removed so that the diameter of the pile was reduced to less than 900mm and the diamond wire saw could be deployed. 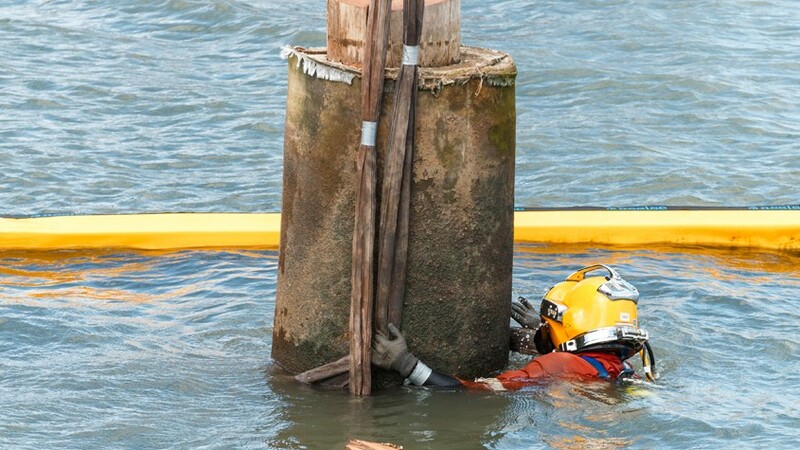 When dive works commenced the crews identified large numbers of broken piles and other debris scattered along the river bed. None of these materials were identified in the pre-demolition hydrographic survey. We acquired a large number of additional lifting slings that the divers could move ahead and sling this debris in an efficient manner so that they were not waiting for the crane to slew back into position. 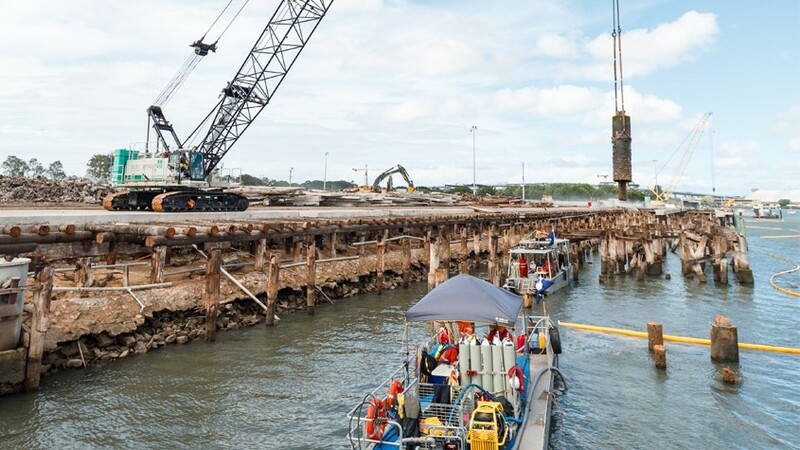 Once a substantial quantity of debris had been rigged the crane and divers moved swiftly along the work area lifting the debris in an efficient manner that ensured the program remained on track. Stringent environmental controls were implemented including dedicated booms and silt curtains to prevent any discharges into the river during dredging works. 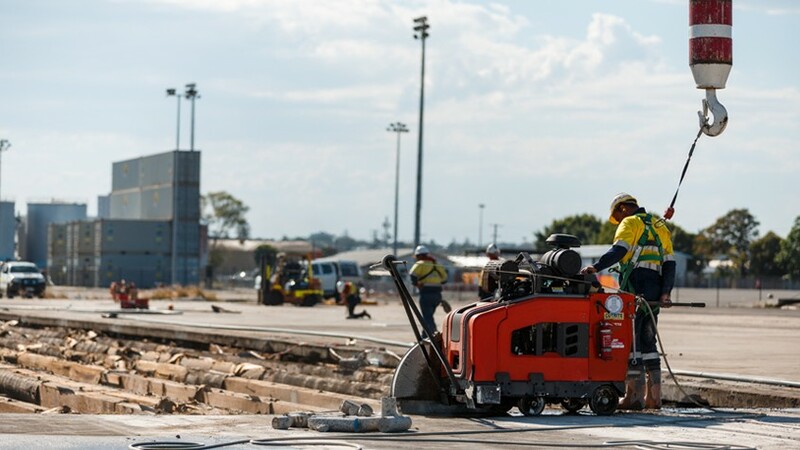 Additional controls such as vacuuming during saw cutting and dust suppression measures employed during hammering to further limit any discharges into the river. The dilapidated nature of the timber substructure required the engagement of a specialised timber recycler to be on site full time to assess every piece of timber material. All suitable timber is being recycled for reuse as high quality structural and architectural hard woods, with select pieces to be used in future landscaping and structural architectural features across the development site. 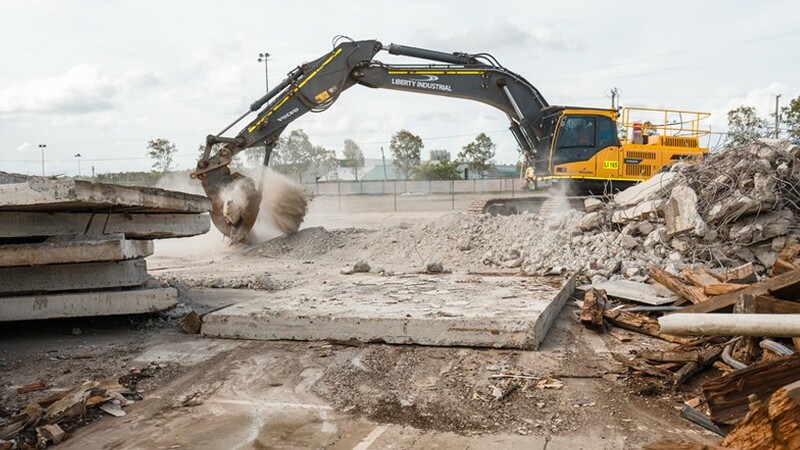 At least 95% of materials were recycled including 100% of steel beams and reinforcing, 100% of the 11,500 tonnes of concrete wharf deck and header beams and more than 95% of timber. 22,500 hours of work was carried out on the project, without a single safety or environmental incident. The project was shortlisted as a finalist for the 2016 World Demolition Awards in the ‘Civil Demolition’ award category.